For more than twenty years, the Journal of Democracy has been a leading voice in the conversation between scholars and practitioners about government by consent and its place in the contemporary world. If democracy means anything, it means robust debates. Over the years, the pages of the Journal have certainly seen their share of lively and illuminating scholarly disagreements. As a service to students and teachers who wish to deepen their understanding of the questions and controversies that surround contemporary democratization, the Journal has now brought together a series of exchanges on the topic. Debates on Democratization explores the issues of democratic consolidation, the reality of the transition paradigm, the advisability of attempting to “sequence” elections and other liberal-democratic reforms, the nature and prospects of the “color revolutions” in the former Eastern Bloc, and the relative merits of presidentialism and its alternatives from the point of view of democratic governance and stability. The volume is filled with insightful, thought-provoking arguments by leading thinkers in the field. Graduate and undergraduate students alike will find it a useful guide to key issues facing emerging democracies today. Larry Diamond is a senior fellow at the Hoover Institution and at the Freeman Spogli Institute for International Studies at Stanford University, where he also directs the Center on Democracy, Development, and the Rule of Law. Marc F. Plattner is vice president for research and studies at the National Endowment for Democracy, where he directs the International Forum for Democratic Studies. They serve as coeditors of the Journal of Democracy. 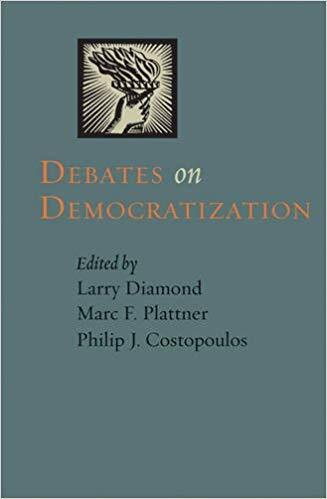 Philip J. Costopoulos is executive editor of the Journal of Democracy.